Thoughts in a Haystack: But Which Are Which? Recently, Southern Baptist Theological Seminary in Louisville, Ky., convened a school-wide event to talk about a new book by a popular evangelical Christian. It wasn't pretty. "It is a new kind of Christianity that is no Christianity at all," says Southern Baptist theologian Jim Hamilton. 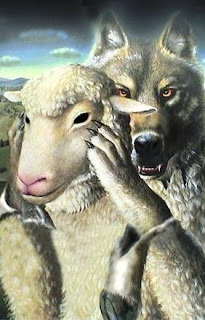 Evangelical author Bruce Ware adds, "I've thought of Brian McLaren for years as a wolf in sheep's clothing, but I think in this book, he took the sheep's clothing off." "The view of the cross that I was given growing up, in a sense, has a God who needs blood in order to be appeased," McLaren says. "If this God doesn't see blood, God can't forgive." McLaren believes that version of God is a misreading of the Bible. "God revealed in Christ crucified shows us a vision of God that identifies with the victim rather than the perpetrator, identifies with the one suffering rather than the one inflicting suffering," he says. McLaren says modern evangelicalism underplays that Jesus — who spent most of his time with the poor, the sick and the sinners — saved his wrath primarily for hard-core religious leaders. "Did Jesus go to the cross as a mere victim? If so, then we have no Gospel, we have no hope of everlasting life," Mohler says. "Did Jesus go merely as a political prisoner, executed because he had offended the regime? Well, if so, that's a very interesting chapter of human history, but I'm not going to stake my life on it, much less my hope for eternity." McLaren is onto something here, says David Campbell, a professor at Notre Dame and co-author of American Grace: How Religion Is Reshaping Our Civic and Political Lives. His surveys show that nearly two-thirds of evangelicals under age 35 believe non-Christians can go to heaven, but only 39 percent of those over age 65 believe that. That's because young evangelicals have grown up in a religiously plural society. "And, it's really hard to condemn someone to eternal damnation on the basis of their religion when you know them well and have come to love them," he says. Campbell adds that young believers are more flexible about Christian doctrine in general. "We also know that — particularly within the evangelical community — the younger you are, the less likely you are to take the Bible literally, to believe that the Bible is the inerrant 'word of God,' as compared to a book of moral precepts," he says. Surveys by Campbell and others show young evangelicals differ from their elders in a lot of ways. They pray less often, read the Bible and go to church less often. And they're more open to culture and social issues, such as evolution and gay rights. Mohler says he's saddened by all this. But he's not surprised that young people buy McLaren's version of Christianity. "I'm sure he's tapping into an exhaustion, a fatigue, a sense of wanting to be culturally relevant, a sense of not wanting to stand out from one's peers and neighbors," Mohler says. "I certainly understand that. I just believe that the cost of following that route is literally the abandonment of historic, biblical Christianity." That "historic, biblical Christianity" Mohler is talking about largely dates from the late 19th Century revulsion against Modernism and will be scarcely missed. "His surveys show that nearly two-thirds of evangelicals under age 35 believe non-Christians can go to heaven, but only 39 percent of those over age 65 believe that." What I have never seen is a study of whether that is a cohort effect or a developmental effect. I'll be interested to see in thirty years (if I'm still around) whether or not the under 35 set has carried those beliefs into their retirement years. "That "historic, biblical Christianity" Mohler is talking about largely dates from the late 19th Century revulsion against Modernism and will be scarcely missed." Yes, why is that some people can't grasp that there can be multiple interpretations of any work of literature? ... why is that some people can't grasp that there can be multiple interpretations of any work of literature? "McLaren says modern evangelicalism underplays that Jesus — who spent most of his time with the poor, the sick and the sinners — saved his wrath primarily for hard-core religious leaders." Indeed. It's long looked to me like the attitude of most of the religious right to Jesus was that they wished he had just STFU and got on with dying for them.